Ambassador Carla Hills, former USTR, NAFTA negotiator and current Chair of the National Committee on US-China Relations has confirmed her participation as a keynote speaker. So has Dr. Yunlong Zhao, Founder and Chairman of the Guoxin Group and Executive Chairman of the UN Economic Development Committee, Dr. Victor Zhikai Gao, Executive Director, Beijing Private Equity Association; Secretary-General, China Private Equity Association. We expect to hear from several more invited keynote speakers in the next few days. Already we have recruited over 100 participants from China, well ahead of our pacing to bring 200 Chinese investors, venture capitalists and entrepreneurs. 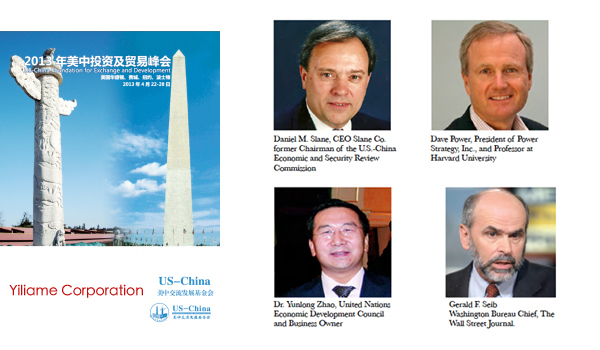 The Summit has confirmed participation by key officials at Harvard University. On April 27-28 2013, the Summit will be at Harvard University. Dave Power, President of Power Strategy, Inc., and Professor at Harvard University and Dr. Kevin Wall is a researcher at Harvard Business School (HBS) in the finance unit will lead sessions during the Summit's Harvard Phase. This section will keep you updated on the Forum as it unfolds. Including all the news, events, and questions asked, confirmation of speakers, guest and moderators and much more. To get email update on activities join the mailing list below.